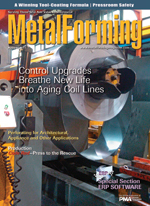 This article focuses on coil-line upgrades and what can be achieved without buying new. Not that buying new is not a good option; it's just not the only one. We spoke with the Industrial Perforators Association and association member company Ferguson Perforating for a close look at the unique metal-perforating process, which competes with thermal hole-drilling processes due, in part, to its ability to create thousands of holes per minute without creating a heat-affected zone. ...as a catalyst for sustainable culture change to ensure that your company ends up on top. If you only measure, manage and improve the same items as your competition, you will not differentiate yourself. It's never good to suffer a press outage, but when such an outage occurs during peak seasonal production, the crisis reaches code red. Combining ideal performance with the capacity to coat large details, Pentaflex has hit on a winning tool-coating formula. How Reliable are Your Test Results?